Only one day after the online-announcement of the ECI to the European commission, two 30km/h-activists had a direct talk to the EU transport commissioner, Siim Kallas. This is of special value as the commission is already discussing next steps on urban transport. The official procedure is that after the announcement of an ECI to the commission the organisers have to wait for about 2 months until the commission has finished its legal check. Then follow 12 months of signature gathering and finally two more months validation of the signatures. Only after, a meeting of the ECI organisers with the commission is officially planned. Our citizens´ committee managed to slightly shorten this procedure. 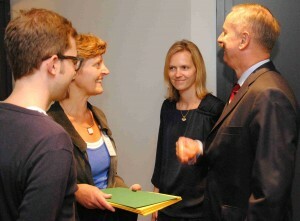 On 17th september, Heike Aghte and Martti Tulenheimo attended a conference in Brussels which was opened by Mr Kallas. They took advantage of the situation and addressed the commissioner personally handing him over the ECI. A short exchange of views followed. This conversation took place just one day after the online announcement of the ECI to the commission. On the conference, Mr Kallas explained that the commission is planning to publish new proposals on urban transport in summer 2013. A public Internet consultation on urban transport to learn about ideas and proposals has just been published. Taking this into account, we can be really glad. The timing of our little handover was just perfect: We can be quite sure Mr Kallas will not forget thinking about 30km/h!